Dr. Crouse opened Crouse Chiropractic in 2005 and we’ve been in our current location since 2014. Since then, we’ve helped Hickory families experience the many health benefits that chiropractic care has to offer while aiming to restore hope in health for our patients. “I want to make a difference in every life that I come into contact with and hope to be an example for those around me.” – Dr. Crouse, Hickory chiropractor. 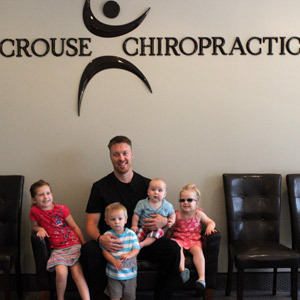 At Crouse Chiropractic, our mission is to help our patients get back to living the life that they enjoy, be it playing with their children, participating in sports or exercise, or simply feeling better. When you become a patient at our practice, you can rest easy knowing you’ve made the right choice for your body. We’ll dive deep into your problem to determine what the best course of treatment will be for you, and if we think you may be best helped elsewhere, we’re happy to recommend a healthcare option outside of our practice. Our entire team will go above and beyond for you! We know your life is busy and long waiting times are not helpful. Therefore, we’re conscious of your time and want you to know that the custom treatment plan we develop for you is designed to restore function and reduce pain as quickly as possible. Curious about how chiropractic care can improve your life or the life of your children? We’d love to speak with you about the benefits. Our office is open until 6PM most days to give our patients extra time for a quick visit after work and we accept walk-in appointments.